a little and a lot: Farewell, 2004. Well thank you, blogger buddies, for your input on my magazine chaos. After much deliberation, I settled on a plan that put both my heart and my magazines to rest. As I flipped through a 2004 issue of Real Simple, I realized what was causing my iron grip on these magazines. It was not the articles on the best maple syrup (of 2004), the best khaki pants (of 2004), or the self-help article on managing stress (in 2004). It was the recipes. Of course. I should have known my foody-ness was kicking in. I recently made the Feb 2009 recipe for Pulled Pork Tacos, and it was delicious. 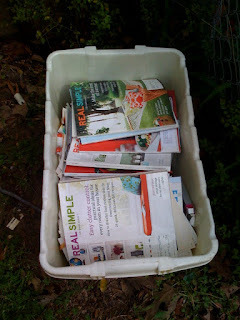 I think it bothered me that I was throwing out all of these "perfectly good recipes." I set to work, allowing myself roughly 5 minutes to handle each magazine. I would look at the cover and see what the highlights were for that month, and then I flipped through the pages in fast-motion, landing in the spot with the "cooking" section. I would briefly ask myself "Would I make this for dinner this week?" If the answer was yes, I clipped. On a rare occasion, I would find an article I wanted to clip. Classic and modern suggestions for a music-lover's collection. Ways to display an herb garden. Grilling basics. Only a handful of articles made "the cut." I did about 30 minutes of magazine skimming a day, and after one week, I finished the job! I was ruthless with my choice of magazine clippings--I finished with a very small stack. It felt so great to dump them all in the recycling bin, knowing I had given each issue its due respect before saying goodbye. I then set to work on my most recent idea to get my recipes under control. I got a 1.5 inch binder. I put dividers with pockets in it - chicken, fish, beef/pork, pasta/veggie, soups/salads, dessert. I put page protector sheets and notebook paper in the back. I love tradition and routines, so it's very easy for me to just find that chicken recipe that looked so good and put it on the calendar for that week. (As I find each recipe, I add the needed ingredients to my grocery list.) You may think this sounds bonkers or too Martha-Stewart-y, but remember--I enjoy cooking! It is my happy place, my hobby, my "chore" that I look forward to each day. My plan for the new recipe organizer is that as I find those earmarked recipes each week, I will cut them out and put them with a sheet of notebook paper in a page protector in the front of my notebook. The current day's recipe will go inside the see-through cover sleeve. After the recipe has been used, I will make notes on the notebook paper if needed ("used tilapia instead of sole"), and file the recipe under the correct category. I'm hoping that by next March, I'll have a year's worth of recipes to prepare, sorted (kind of) seasonally within each category! Each year, I will weed out the not-worth-it recipes to make room for new and fabulous ones. By the time I'm 40, I will have one amazing cookbook, and I can do away with the rest! I know you are probably disgusted with my love affair for perfectionism. But at least I'm eating well! Way to go, Jesse! And I love the sound of your build-as-you-go cookbook. What a way to figure out your favorites! I did something similar when we moved in that I put all my recipe cards into small cheapo photo albums, organized by meat/sides/breakfast/bread/etc. Good idea with the notebook paper, though. I have way too many little bitty cards with notes all over them and hardly readable. My recipe-practical tip is to make your notes with a fine-tipped Sharpie. It stinks to realize you can't read what you wrote because the oil splashed on the page and the ink soaked out into a general gray blob.